Mixed-Up Anthems; Canada to Annex U.S.! Who Is Gord Lindsay? : The Man and His Music, The Man and His Musings, The Man and His Memories, The Man and His Life in Pictures (or not), The Man and His Story, The Man and His Other Stuff. While working in the Medical Library at a major Toronto, Canada, hospital, Gord wrote a song for another employee, a rather bold-tongued woman who worked in the Communications Department of the same hospital. One of her running barbs was to keep asking him what he was getting her for her birthday. So, one year, Gord wrote and recorded a song about her, and presented it to her on the day. The song was called "Charlene," and she played it so much for fellow hospital workers that she broke the tape. Gord then put the song on an answering machine connected to a business telephone line he had, and thus, The Gord Lindsay Music Line was born. Now, she could tell everyone to just call the line, and listen to her song. She became an instant celebrity. To hear the song, just click on the title word, right here: "Charlene." When word got out, people started asking Gord to do songs for them, and he obliged. Requests first came in from the local health care industry, and Gord wrote and recorded songs about a hospital departmental secretary ("Lee"), the "best wife ever" of a hospital pulmonary function lab director ("Regina"), a visiting fellow from the Canary Islands ("Dr. Villar"), a doctor with a pain clinic who was also a broadcaster ("Brian - The Man of Gold"), the friend of a hospital Auxiliary's office manager ("Brent"), and the friend of a friend of a research laboratory secretary ("Ken"). All the songs played on "The Gord Lindsay Music Line," and made their subjects instantly famous! Gord then branched out with songs for members of the general community who had somehow heard about his Music Line. He wrote and recorded "Cindy and Joel" for a local food store entrepreneur's anniversary, and then did "Aaron Joshua" for their son's Bar Mitzvah. He did "Debbie and David" as an anniversary gift for a prominent local lawyer, and "Sarah and Ofer" as an anniversary gift from a very special young man to his very special wife. Gord got busy, and stopped doing the songs but was persuaded to "come out of retirement" to do one more, which he turned into a 13+ minute saga called "Mike and Michelle: From the Beginning," which traces the paths of both of these first anniversary celebrants from a time before they were born! You can hear the full version by clicking on the title. ALL KINDS OF STYLES -- AND AUTHENTIC! These songs were all custom-designed. After thoroughly interviewing the clients who hired him, and who also specified details they wanted in the song, Gord decided on the style or genre which would suit each subject. For instance, for "Lee," as it had been with "Charlene," Gord went with Country and Western. For "Regina," it was Nightclub. For "Cindy and Joel," it was, as requested, Sixties. For "Ken," it was Forties. Each song was then hand-crafted, and written from scratch, incorporating the important details, "in-jokes," and personal references provided by the clients. 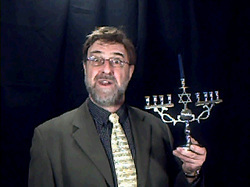 And, yes, they were written, recorded and sung singlehandedly by Gord Lindsay in a hurry, and would have benefitted from retakes and refinements, and, yes, perhaps Gord is singing better on his YouTube videos, Chanuka Funicula (see bottom of this page) and White Purim (see it on its own page). Still, in their rough-hewn, rolled-up shirtsleeves way, these songs represent an authentic, almost live version of original, personal music, recorded on the fly, with one hand on the microphone, and one on the tape deck controls. Music by a real person about real people. Since these songs played for their moment in the sun on The Line, and then were stored, a great danger to musical culture arose in that they might never see the light of day again. This has now been remedied by the availability of an ALBUM containing all the songs, downloadable from Amazon.com in the United States, and iTunes U.S., Canada and other locales, plus some other electronic stores. HOW CAN I GET THESE AMAZING SONGS? 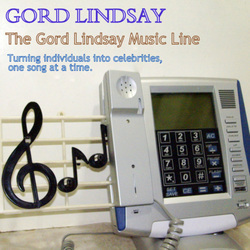 The Gord Lindsay Music Line album is also available on iTunes in several countries around the world. Apparently, you can only download music from the iTunes site in your own country. Click on the Picture Below For Another Exciting Page Featuring My First YouTube Video!